There could be a future where we eat incredible, sustainable, engineered foods—3D-printed or lab-grown meals, chemically optimized to unleash the perfect combination of flavor and nutrients to fit our bodies and our tastes. Better tasting hot dogs with harmful fats removed! Healthier snacks with accurate expiration dates! Or, we can continue on our present path, and Americans will keep eating the same foods we always have, including foods that make us sick and obese. If the United States would like a say in the future of food, the government and the people need to start paying attention to our food scientists. Take Karen Schaich, a Rutgers food science professor who studies the very nature of how food ages. Schaich observes how common foods like tortilla chips and peanut butter go rancid, and believes she’s found processes that cause food to spoil faster than we think. But she struggles to get this important research funded. She’s not the only one—American food science itself is struggling, and for more reasons than funding alone. We have food science programs, but some of the food scientists that I spoke with find it difficult to attract the funding needed to innovate and come up with novel solutions to food science and nutrition issues through basic research. Others left publicly-funded food science for greener pastures in private industry. Not all American food science is suffering, E. Allen Foegeding, professor at the North Carolina State Department of Food, Bioprocessing and Nutrition Sciences, told Gizmodo—he noted that the fields of sustainability, microbiology and food safety have seen lots of attention. Instead, what’s lagging is what some of the folks I spoke with called food innovation, or interdisciplinary research combining the fields of physics, chemistry and engineering to understand food down to its molecules to create solutions for the future. For example: cows emit greenhouse gases, so let’s lab-grow a replacement beef. Consumers don’t want to eat trans fat, so let’s engineer a healthier alternative that has the same physical properties. many startups are trying to be innovative, private innovation prevents the spread of knowledge for other scientists to build on. “The situation in the US is sad,” said Alejandro Marangoni, professor in food science at the University of Guelph in Canada. Marangoni should know—his Canadian lab innovates with the structure of fats and oils, replacing unhealthy fats with oil and cellulose-based gels in products like hot dogs, or imaging milk fat using high-powered microscopes. Sure, the United States has scientists doing work like Marangoni’s, but it doesn’t seem to him and scientists like him that American food research has a central, forward-looking goal. “We need more of that type of conversation at the country level and decide where we need to be putting our money to help society move forward,” said Foegeding. Today, food science funding is patched together. Federal funding—your taxpayer money—goes mainly to nutritional, agricultural and food safety research, leaving a void for those interested in innovation. Scientists start looking for funding through the United States Department of Agriculture’s National Institute of Food and Agriculture, said John Coupland, professor at Penn State and president of the Institute of Food Technologists, but “the hit rates for these grants are not good,” he added. NIFA grants typically go for several hundred thousand dollars a piece, enough to take on a few Ph.D students and pay for travel, but mostly relate to agriculture in some way, as opposed to, say, discovering all of the biological components of milk. Nutrition studies, meanwhile, might receive National Institute of Health grants, also for a few hundred thousand dollars. “The NIH doesn’t consider pure food research in their domain unless you’re doing something clinical,” that is, the research must act as a cure to some disease, said Marangoni. “The NSF doesn’t want to see food research because that’s USDA stuff.” I contacted NIFA asking where someone interested in researching food after it’s already been picked from the soil, for reasons other than nutrition, might apply for public funding. The agency has not yet responded to the inquiry. The NSF does offer grants for food scientists interested in starting a business: The Small Business Innovation Research’s (SBIR) Biological Technologies program gives $225,000 in seed funding to researchers interested in creating a new food-based technology. Such grants have been used to fund mainly food safety or agricultural technology startups, said Ruth Shuman, SBIR program director, but there’s no reason that folks interested in using technology to find a new process to alter food and its chemistry can’t apply, she said: “If people started sending ideas for developing new foods, I would be happy to review those proposals.” One SBIR-funded program looks for a new way to extend the shelf life of food, while another looked to create a non-synthetic red food dye. But most basic science doesn’t progress with a marketable product in mind. When scientists are trying to make a cookie that’s better than all cookies, that’s healthier on a molecular level, tastier, and cheaper all at the same time, sometimes they want to do it for the better of all of us people and society, rather than personal gain. Of course, a scientist can enter a field with the eventual goal of making a ton of money on an end product, but for most basic research, there’s years of lab work shared with and reviewed by other scientists before a product hits the market. Still, industry is exactly where scientists head for funding help. Since NIFA funding alone just isn’t enough to generate what universities like to see, Coupland said, “you look around for other sources. It might be a straight out industry contract.” By doing research for the industry, researchers can use the extra money to buy shiny new equipment and keep their lab up-to-date. Even those industry contacts don’t always make ends meet. Schaich’s food science lab at Rutgers University in New Jersey has long relied on industry arrangements to study the way that fats and oils change over time. Today, her lab is aging, and not like a high-end sharp cheddar. Yellowing letters taped to the wall show dates from thirty years ago. The machinery looks straight out of a 1980s video arcade. Even a bag of potato chips labeled for research purposes only displays an outdated Lays’ logo. As food scientists express their frustration procuring funds for basic research, this broken system is having a tangible impact on America’s international standing—we don’t seem to be keeping up. In 2016, American institutions published 85 articles out of 177 submitted to the fairly well-cited journal Food Chemistry, compared to China’s 430 published, 1754 submitted, Spain’s 148 published, 338 submitted, and Italy’s 125 published, 254 submitted, according to documents obtained by Gizmodo. A similar pattern pops up in a moderate-impact journal Food Research International: the United States published 26 out of 77 submitted articles, compared to China’s 33 out of 662, Brazil’s 73 out of 378, and Spain’s 43 out of 235. Statistical analyses weren’t provided. “Of course, food scientists don’t just publish in food science journals,” said Coupland. “Many food scientists work on food as their primary job but are plugged into other fields… where they’re using the same techniques and the same language,” like genetics or alternative fuel sources. Still, the American scientists interviewed for this article almost all spoke jealously of Marangoni’s large lipid lab, or of Wageningen University, the Netherlands’ food science Mecca. How did things get to be this way? When Schaich began as a food scientist over 40 years ago, the industry-university relationship felt like a partnership. She suspects a combination of many of the pitfalls of capitalism brought a sea change—for instance, large tobacco companies like Philip Morris and R. J. Reynolds buying or merging with food companies in the 1980s, or Reagan-era trickle down economics. She noticed the General Foods research center close in the 1990s, and thought the takeovers and changing economic policies encouraged these companies to focus on profit over innovation. “I have former students working at Mondelez,” once owned by Phillip Morris, “and what was basic research that brought development of a lot of the low fat cookies, Cool Whip and a lot of things we take for granted are not being done at all,” she said. “They’re just monitoring existing product.” Now, lots of food companies rely on small entrepreneurs to innovate, and then buy up the new products, she said. Eydelnant and others thought that the startup model could actually put America at the forefront of food innovation. Memphis Meats, for example, is a Bay Area startup trying to grow meat in a lab to prevent animal slaughter. Private funding allows a product to hit the shelves faster and allows the company to stay nimble said Uma Valeti, Memphis Meat’s CEO and cofounder. Taxpayer-funded research lays the groundwork, while private industry can provide new ideas. He thinks things are working better that way, too. “Currently, we feel that private funding is the b­­est option for producing high-quality research that leads to better food for everyone,” he said to Gizmodo in an email. But as previously noted, startups need to make money. Privately-funded research won’t necessarily better society or expand the general knowledge base, as companies patent their products or maintain industry recipe and formulation secrets like Coca Cola’s flavor or KFC’s spice combination. 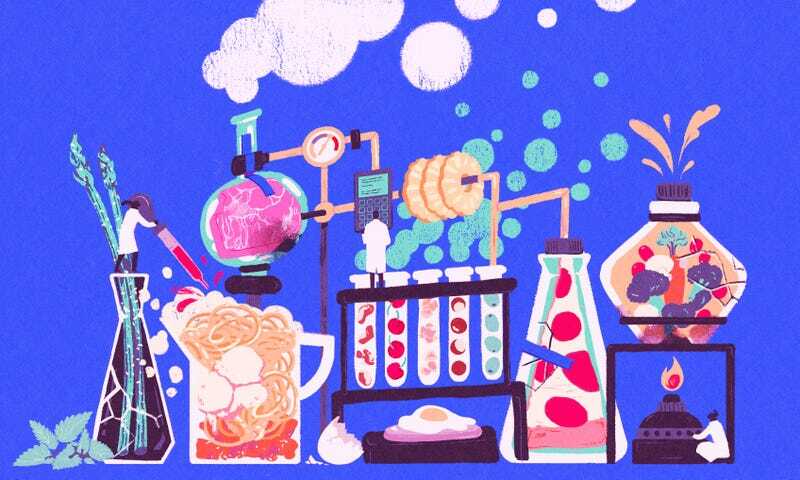 Some researchers think America needs something akin to a food moonshot—a major reprioritization of our country’s food science money to focus on actually understanding all of the chemicals in food, how we taste them, and how they interact with our bodies. This could lead to food innovations that actually prevent disease. “When you consider the negative impact food can have on our health, how can this not be an national priority?” asked Mills. Why, he asked, do doctors prescribe Lipitor to lower bad cholesterol, when there’s the potential to simply personalize and alter our diets so cholesterol isn’t high in the first place? And, imagine if private companies shared their food science secrets with the world? We might have a true understanding about how our own bodies work and how to eat delicious, affordable, optimized food. Many companies are trying to do that, but that doesn’t seem to be stopping us from trashing our bodies or being spoon-fed politically and industry-motivated nutritional recommendations, taking on shady fad diets or stuffing ourselves with vitamins that don’t work. Ultimately, we probably all need to change our mindset about food science. “There’s a sense that food should be natural and anything that makes food not natural, and physics and chemistry don’t sound natural, that’s a bad thing to do,” speculated Coupland. “Food technology” as I discuss here “won’t attract attention from big-name journals like Science, Nature or even The Journal of Food Science.” Coupland would at least like to find ways to get universities to value this type of forward-looking research more.